Peltigera brittanica, ("flaky freckle pelt"), chimeroid form, on a mossy tree stump. southern Washington. A few lichen fungi have the ability to form very different lichens with different photosynthentic partners. 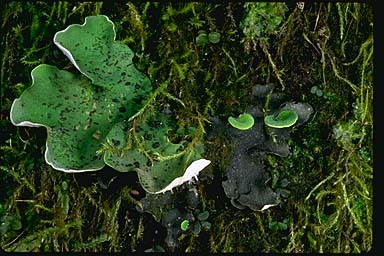 Petligera britannica is usually an association between the fungus and a green alga, as shown on the left. Loosely attached cephalodia ("warts" that contain cyanobacteria) dot the upper surface. Occasionally, though, the fungus will form a lichen with a cyanobacterium as its primary partner, either as an isolated individual (which used to be named as a separate species) or as an outgrowth of the more ordinary lichen, as shown on the right. Sometimes little lobes with green alage emerge from the dark cyanobacterial lobes.